Dogs are welcome on Green Mountain but must be on leash unless they have Boulder's off leash tags. Non-Boulder residents must pay $5 for parking at the Gregory Canyon Trailhead -- though it's possible to park for free on Baseline Road. 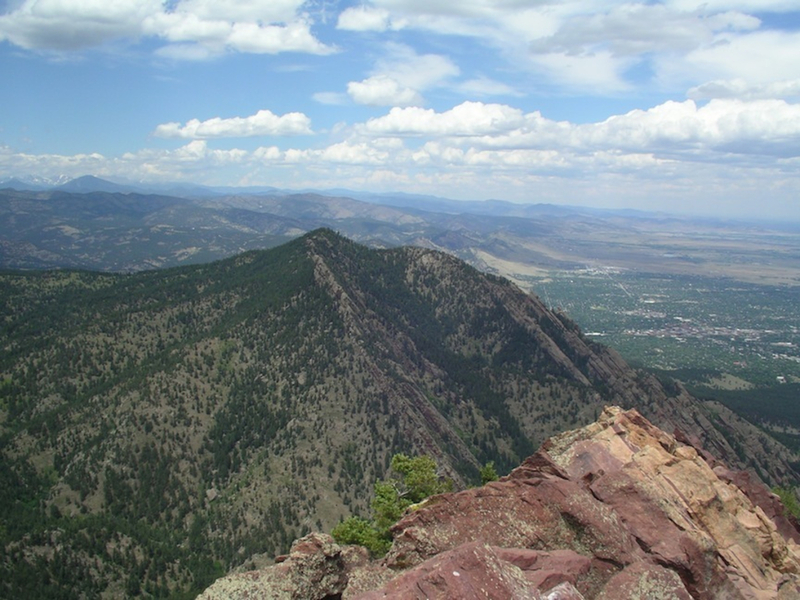 At 8,144 ft. Green Mountain is the most accessible of the “big three” Boulder summits (the others being 8,461 ft. Bear Peak and 8,549 ft. South Boulder Peak). The standard trailhead for a hike up Green is located in town at the base of Gregory Canyon on the perimeter of Chautauqua Park. While none of the trails that lead to the top are technical, there is 2,278 feet of elevation to be gained in a compact 3.2- mile route (6.4 miles round trip). The wickedly steep Amphitheater Trail is an instant lung-buster, featuring a quarter mile start of well-maintained stone steps that get your heart rate racing before you’ve left sight of the parking lot. Thankfully, the namesake amphitheater rock formations are at the beginning of the trail and make for a nice excuse to take a photo — and catch your breath. Because of its easy access, Green makes a wonderful hike in any season. Winter is a special treat, not only for the serene, brisk atmosphere but also for the opportunity to look out upon Colorado’s scenic landscape adorned in its winter palette. Summer treks offer an escape from heat, gradually getting cooler at higher elevations. You may see locals jogging up Green or training with overloaded backpacks — it’s a favorite destination for those aiming to get stronger. It’s a tough hike, but certainly doable by anyone with a modest level of fitness and a little bit of perseverance. And despite being within city limits, you’ll feel like you’re a world away, immersed in the piney, rocky wilderness. A second option starting from Gregory Canyon is the Gregory Canyon Trail, a suspiciously flat path that offers a brief warm up before matching the rugged steepness of the neighboring Amphitheater Trail. Both trails are decorated with gorgeous rock formations, shady woods and humble, seasonal creeks. Eventually, the two paths converge and join up in a burly path to the summit. 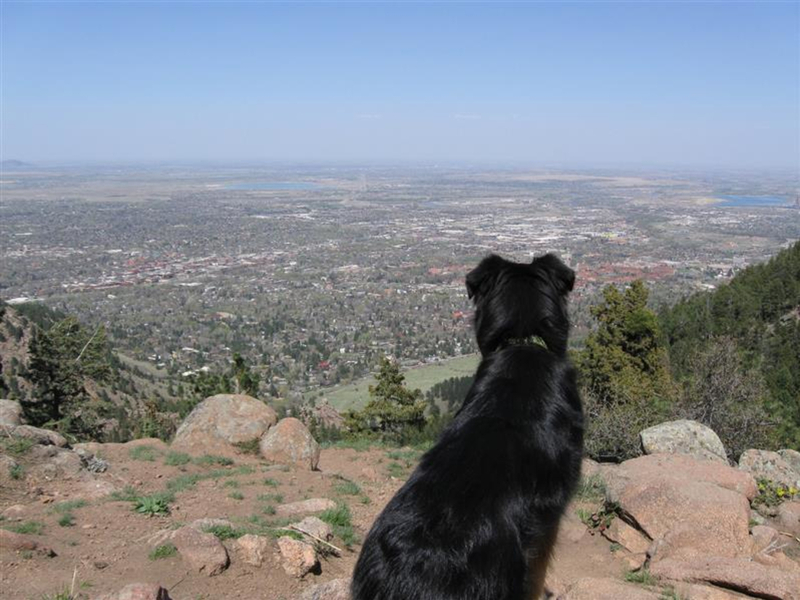 There are several excellent viewpoints along the way, including great spots to look down upon the University of Colorado campus and 6,843 ft. Mount Sanitas. The final push to the top twists through one final rock garden before concluding at a welcoming, flat summit. A crowning boulder rises above the gnarly pine trees and affords 360-degree views; on a clear day, you can see from Pikes Peak in the south to the Medicine Bow Peaks of Wyoming to the north. 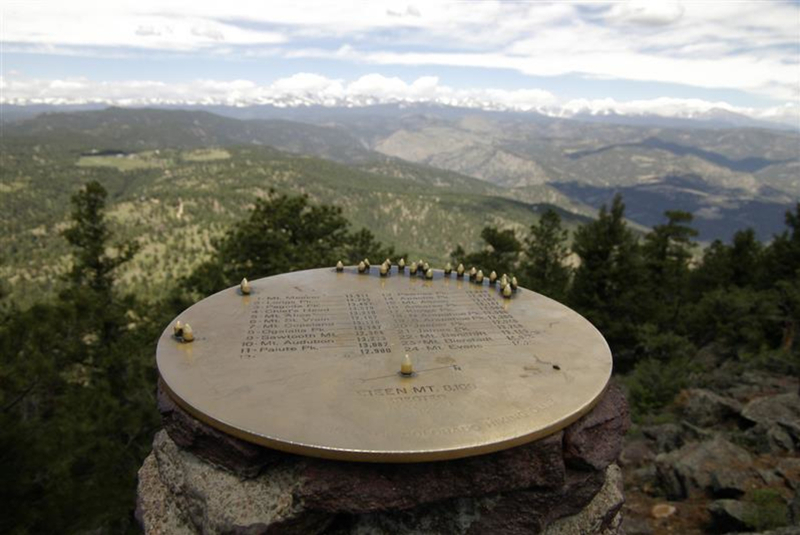 A summit register and a brass disk showing a 3-D chart of the neighboring mountains give added value to the great views. In late summer, don’t be surprised to see a living armor of ladybugs clinging to the rocks. From the top of Green, you can return via the Gregory Canyon trails or continue on along the southwest side of Green along the Green-Bear trail, so named because it connects Green Mountain and Bear Peak, not because of the presence of green bears. This is Green Mountain’s secret side, a less-traveled place that is notorious for fields of brightly colored alpine flowers. Even on busy weekends, this tends to be one of Boulder’s quietest places. There’s also a good chance of spotting some of the local wildlife: black bears, mountain lions, peregrine falcons, elk, deer and coyote all call these foothills home. Eventually, this trail connects to the popular Mesa Trail, a well-traveled 6.7-mile path that skirts the base of the high peaks from Chautauqua Park to Eldorado Springs. From here, you can continue on to Bear Peak (and beyond) or circle back to Chautauqua and make a hearty loop. Hikers looking for a genuine mountain day right in town will love Green's accessibility. And it's good to go year round! To reach the Gregory Canyon Trailhead, take Baseline Road west from the intersection with Highway 93 (Broadway) and go 1.4 miles up the road. You will pass Chautauqua Park on your left. Gregory Canyon Parking is at the base of the steep Flagstaff Hill Road; take a left before you begin ascending the road. Note: As of 2015, this trailhead is closed for repairs due to the 2013 floods. Please park a short distance back at Chautauqua Park or along Baseline Road in the designated parking areas. Non-Boulder residents must pay $5 for parking at the Gregory Canyon Trailhead -- though it's possible to park for free on Baseline Road. You'll just have a short walk to the trailhead.